I am committed to making a difference in the lives of the homeless. I am choosing to live on the streets until the necessary amount of funds and awareness are available to provide a warm shelter and food during the winter months of 2014/15. I personally made it a goal to take responsibility for raising $100,000 for this cause and with your help, we reached it! The total campaign is to raise $300,000 and I believe, together, we can do it. You can choose to donate from this page and see progress each day. *I have chosen to stretch my goal to $150,000. This would be half of the total for the Winter Sanctuary program. I've got two more days on the streets to make it out here for a full two weeks. Even though I'm tired, I believe in this cause and I think we can make it to $150,000 in the next couple of days. I'll be riding the light rail home to Capital on Saturday for the 6pm service. Can't wait to share my experiences with you. Please continue to donate so we can reach $150,000 by Saturday! Help us make a radical impact in the lives of those who need it most. Our mission is to raise $300,000 in order to provide temporary housing and food for hundreds of Sacramento's homeless during the winter months. Each winter, cold and wet weather conditions threaten the lives of nearly 1,000 homeless men and women who live on Sacramento-area streets. The Winter Sanctuary Program was founded to meet the needs of these individuals with nowhere to go. Comprised of a network of religious congregations under the leadership of Sacramento Steps Forward, Winter Sanctuary is the only winter shelter option for single, homeless adults. The goal of this privately funded program is to help these individuals, who all too often fall through the cracks. Age: 70% ofWinter Sanctuary guests are between the ages of 25 and 54. Less than 10% of guests are Transition AgeYouth age 18-24 or Seniors 62 and older, 7% and 5% respectively. Praise God for sharing God's love for the homeless and challenging others like me to do likewise! Phenomenal testimony this past Saturday night! Moved to tears with your authenticity. Thanks for this great effort and all you do in our community! Pastor Rick we are so proud of you and so humbled to call you our Pastor. God bless you for always leading us by example. It is an honor to be plugged into a church that is awake and following God. Welcome home Pastor Rick, welcome home! Thank you for taking this step of faith, your compassionate servant heart, and loving like Jesus! I am so proud of you, my pastor. I know this wasn't easy for you or your family. You are truly amazing. Pastor, we support you in everything. You are an example of a servant's heart to our congregation and every one. Praying for your safety, health, and anointing. God bless, Agrifino and Irene. God Bless you Pastor Cole as you shine for Jesus and model for the next generation how to love a city! Thank you for living the Christian life, not just preaching it. Praying God protect you and all your family, that He keep you spiritually sound and on the straight and narrow and your family all continues to be a bright, shining beacon of love and hope for this dark world. Thank you for being a light in this world that is becoming darker and darker. We are very proud of you Pastor and we are honored that you are our Pastor. What an inspiration you are to us all! I appreciate your heart of compassion, your faithfulness to the Lord and your obedience to what He has called you to do. May your life continue to be a witness to those around you as you continue give Him all the glory. Thank you for your sacrifices and leadership. YOU ROCK....thank you for having a heart for the less fortunate. I wished I had more to give at this time. Your doing a wonderful thing for the homeless! Thank you..and may God Bless this endeavor! Thank you for your hard work and dedication to a very noble cause! You're an inspiration to all. You are such an inspiration - putting feet to your message. I can't wait to hear more about your many interactions and encounters. Thank you Rev for showing us what its like to walk and serve like our Lord and Savior Jesus Christ. Thank you for hearing from the Lord. God bless you and those you meet on this amazing journey. Way to go Pastor Rick! I personally was not excited (very worried) about you being out there day and especially night but you did what you were called to do and I am proud that you are our Pastor and I am pleased with the attention you have brought to the needs of the homeless and am looking forward to your incite and learning from your experience. Hey James, What a great way to raise the funds for such a worthy cause. My wife and I used to enjoy Capital Christian Center and Pastor Cole's teachings and sermons many years ago until we found a smaller home church blocks from our home. I had no idea this ministry to the homeless during the winter months was something he and CCC had going. Glad to help the cause to continue the ministry. Thank you for being an example. Praying for you and the wisdom you have learned to share with the church and the community. In honor of the caring hearts of Joe and Nancy Benvenuti. Thank you for walking with our brothers and sisters! We are humbled by your example and encouraged to make a difference in our community. You are a true servant leader.....Capital is abundantly blessed to have you as their shepherd. Thank you for truly leading by example! We are all behind you Pastor!! I am so proud to be a member of Capital Christian. You inspire me to have a stronger relationship with God! God bless you! May God continue to bless you and keep you in his tender care as you seek to bring attention to the plight of the homeless. Be safe, Pastor Cole! Thank you for bringing a light to some of the most in need and most misunderstood. God bless you for your commitment to Him and ALL His people. Walking the walk, stretching service, increasing faith, and bringing awareness about homelessness. What an amazing response. Thank you for making an impact! Thank you Pastor Cole for all you do. You are an amazing man! I am so glad God blessed us and our church with you!! Can't wait to have you back at church! We admire you pastor Rick! Thank you for sharing your journey on social media and giving us the opportunity to participate with you. Someone once said to me that many of us are a paycheck or two away from homelessness. Wonderful thing to humble yourself and do. May you fully grasp the wisdom of this assignment for you & the community. Praying for you! Don't ever be afraid to push tithing and giving. We have been blessed because of that message. Praise God and Thank you Jesus! Dear Pastor Cole, I am extremely proud of you for selflessly giving up your comforts to walk in the shoes of the homeless. That is what Jesus would do. God bless and keep you. May the Lord's protection be on you Pastor Rick Cole for all the days of your life. We pray for you. Shalom! Dear Pastor: I believe in the cause for the homeless. Thank You for doing the work of Jesus. You've given me another reason to love Capital Christian Center. You're AWESOME and I believe God is pleased. Matthew 25:35 says, for I was hungry and you gave Me food; I was thirsty and you gave Me drink; I was a stranger and you took Me in. You're doing this and helping others to do it. GOD BLESS YOU!! Appreciate your work in the Kingdom. This is to encourage you. WE BELIEVE IN YOU PASTOR RICK, You believe in us. we really appreciate the birthday cards you send us every year. I cherish it. I know you care about people. You cant save the world but you are definitely doing your part . Your light is reaching past pluto dude! Take care. oh and You have a wonderful wife and family. take care. Ruperd & Frances. Hello to you all the way from Houston, Texas James. I'm proud of what you are doing to help so we're helping you. Keep up your quest for the truth and the light. You're on the right path. You have a heart of gold Pastor Rick! God bless you pastor Cole. The whole reason I love coming to church and hearing you preach is because you not only talk the talk, but you also walk the walk. Blessed to partner with Rev Rick & our area churches to make some nights warmer & friendlier this winter for some folks! I'm so proud to be a part if a church lead by such a leader. Thank you for leading by example. Thank you for stepping out with Pastor Rick for this amazing cause. So grateful my kids and I are a part of such a wonderful community of compassionate and caring people at Capital Chiristian Center/School. May God keep you safe on this journey and bless you always. You are doing something amazing ! We are so proud of your work and are praying for you! God bless you pastor. What you are doing is awesome!!! So very touched at what you have been called to do.. This is an amazing cause! Not many people would take on this challenge to understand the true needs of the homeless. I can only imagine what this journey will provide in helping their needs, and in adding you your role as a pastor and deepness of a man. I will pray for you during this journey and also look at my own need to do more to help those in need. We can think of a million things we cant do, but your ability to allow the holy spirit to work in and through you makes us dig deep and ask "what can I do to help! " Thank you for choosing "God's Way" you are a true testament, inspiration, and you restore faith in humanity which allows this world to see the heart of our Heavenly Father!!!! Be Blessed in Jesus Precious name AMEN! Proud to serve under you Pastor Rick! Love you Rick...thanks for your leadership and friendship. God bless you, Pastor Rick! Rick walks the walk, he is a true inspiration! Very nice thing your doing James! Great Job!! I have socks, blankets, etc... I can donate for the cold winter months. My food business is always donating to to the food banks, does your church have one and will they pick up? We are praying for you Pastor Rick. Have faith you will hit the target this week and we will see you Sunday. Thank you James for your willingness and example. Keep it Ps Rick! So proud of what you're doing for Sacramento and for the commitment that you have made to help those who so often are unable to help themselves! Love you and CCC! Pastor Rick, God watchover you, strenghten you, and give favor unto you. God bless you and your family. Love what you do and Being from California and now living In Missouri.. I grew up in the Tracy Stockton Modesto Area and my oldest son Lives in Browns Valley and works at Heritage Barber Shop in Marysville.. That's my area and my people!! I am proud to help with what I can!! no one especially a veteran should be homeless!! Thank you for all you and your wife Kelly do!! Love you and P Roach!! Proud of you thank you for doing something I could not! I've always had a heart for the homeless. Praying saftey and connections for you while you are out there! Love you Coby!! Hope the good deeds continue forth to infinity!! what a privileged, from fallon Nevada , god is working all over, stay strong in his word. We are so proud of you, Pastor Cole! Great work you are doing, we are thankful to be a small part of it. Many blessings! Love and compassion is a beautiful thing. God is always good. May many come to know him through your adventure. A great thing you're doing. Couldn't pass up the opportunity to support you! You're a great man Jacoby! FIGHT THE GOOD FIGHT JACOBY!! Way to go Rev. very inspirational. I support you. Keep up the Good work. Your an angel. Apples don't fall far from the tree..
Be blessed as you share Gods love. His kingdom come His will be done on earth as it is in heaven. Thank you!!! God keep you, God shine his safe on you and keep you safe! Just love you to pieces, Pastor Rick. You truly walk the walk. You are a inspiration to us Christian to do good deed in this world. God Bless! Not going to be 'on the streets' on my watch! Pastor Rick: Thanks for your genuine love for all people, for your leadership from the front, and for giving us a clear example to follow. In honor and loving memory of your father, Pastor Cole, my first pastor. May God bless your work here, Rick. Granite & Marble Natural Stone, Inc.
We are praying for you and everyones hearts God will touch through you being on this journey! Give it up for our Pastor!!!!!! Yay! Thank you, Pastor Rick, for your sacrifice and for serving in this unique way. You're in my prayers. So proud of what you are doing, proud to call you my Pastor! And privileged to support this vital ministry. Our prayers are that you'll meet the goal soon and we pray that God will touch the lives of homeless people through the Winter Sanctuary and in other ways too. Pastor Rick, We are praying for you and are so blessed by what you are doing for the Lord and for the homeless in our community! I was so blessed volunteering at the homeless sanctuary before, and is happy to do it again. This was definitely unexpected of you & very courageous. Never in a millions years have I've heard of a story so close to home. My son & I are praying for you and are so deeply touched and super blessed! You ROCK!! Thank You Pastor Rick for bringing this major problem to the attention of our community -We are our brothers keeper. May GOD continue to bless you in all your good deeds in doing HIS work. Good Luck James! You're doing a great thing for a lot of people. So proud of you Pastor and so blessed to be a member of CCC! I am very proud to have you as my Pastor. You are such a great inspiration!! My prayers are with you! James, you are an inspiration! You are almost there my friend!! You are a blessing to this community and beyond. Thank you for all you do, Pastor Rick! God's will and mission will be done through those who loves Him. Will pray for the homeless and this great cause. James, it's not much but I think what you are doing is awesome! God Bless you buddy! Thank you for pioneering new ways of leading by example with humility and compassion! Thank you Pastor Rick for being so awesome and for leading by example. Awesome, Pastor Sherwood is looking down at you with great joy and protecting you. Donnie--Your dad is helping a great cause. Praying for you and am so proud to say that I used to work for your organization at CCS. I’m in Texas now but I support your mission 100%. Thank you for having a heart for the Homeless. There, But for the Grace of God, Go I. Thank you for doing this. I love how you are giving up the luxuries of life to help others. I am praying to reach the goal. Love this Cause....We love your heart and that this is going to change soooo many lives! We are all aware there are needs in our surrounding communities, but it sometimes takes one of us to bring it to the attention of many. I am thankful for those people and am excited to participate in this cause. We love you Pastor and support you 100%! Pushing you all the way to keep you off the streets! Sending you prayers that you reach your goal! Happy Birthday and may God bless your efforts! God Bless you for helping those in need. thank you! Pastor Rick, you are an amazing leader and inspiration. We are so thankful to have you lead our church and guide us in our faith journey. We are new members but it is an inspiration to see a leader do what they preach. God Bless You! Good work. Just don't want to see you sleeping on the streets in a suit. Praying for you and so humbled by your heart and outreach. Thank You James for leading to help others. I am sure you have already been tremendously blessed for doing this, and that that isn't why you are doing it, but may you be richly blessed for what you are doing, and your willingness to allow yourself to be very uncomfortable, to help people you don't even know! You are a great inspiration to me! I know the many people will be blessed by this... thank you! I am sharing your story! Proud of you! Funny you didn't want to go to Church on Saturday. Thanks for getting word out. I will pass your message forward. I'm bless to be able to support you! Brilliant idea! My friend, Susan Brown, posted your story on Facebook. She believes in the grace of God that you have shared with her and so many others. God Bless You! We support you 100% in helping the homeless, and what a great idea of the Lord to go to the streets as a homeless yourself to raise the money to help the homeless this winter season! GOD BLESS YOU our pastor!!!! I admire you for all the good that you do for the church and our community! Pastor Cole you are a blessing and I want you to know how much you changed my life and helping me get closer to God! Thank you!! bless you for caring enough to do this for our community and I'm positive you will meet your goal. We're praying for you and this cause. Thanks for showing people with the love of Jesus really looks like. My sister shared this with me. I live in Florida, and I want to support your brave efforts. I will also be praying for your ministry during this time too. God bless you! I wish more pastors would come out of their comfort zones, big homes, cars, swimming pools, etc. and help the less fortunate with tangible needs. This is the Lord's doing and it's marvelous in His sight. I have no doubt you will reach your goals, even over and above your goals. God's Blessings. Good luck and be safe. You're an endless well of inspiration! God is coming up with some great ideas for you. Thank you for having the heart to fulfill them. I have completed my two-week journey on the streets of Sacramento. I will be boarding the Light Rail tonight and returning home for the 6pm Saturday service. This effort has reached several around the nation, even the world, and our team wanted to make this coming home celebration available to you through live stream. Together, we completed my personal goal of $100k by day 9 and I added a stretch goal of $150k when realizing my journey wasn’t finished. We are so close to that $150k mark and I think we can make it there before 6 tonight. I'm ready to share what’s I've learned and excited to be coming home. Keep sharing. Keep donating. When I started this journey, I was unsure how long I would remain out on the streets. We didn't know if the $100,000 goal was even feasible in a two week period, but we prayed and asked God for His help. You helped me reach my goal in one week! I was blown away. Even though the funds came in, I didn't feel like my time out on the streets had been long enough. I felt God was still wanting to teach me things and I knew my experiences here would challenge me and allow me to grow. I'm getting tired. I guess that's to be expected when living in these conditions. My heart has another level of understanding and compassion for what the streets can do to a person. I'm ready to share my experiences with you on Saturday at 6pm. We will be live-streaming the service for those out of town. The details will be published on our website and Capital's Facebook as well. If you are in town, I would encourage you to make it out on Saturday night or Sunday at 9 & 11am. My family came down and spent the day with me yesterday. Nate & Lisa (son/daughter-in-law) came up from LA and pitched a tent next to mine in the alley. Nate also brought his guitar and it was so life-giving. I've been told they will post a video of one of his songs on Capital's Facebook page tonight- so look out for it. I have chosen to stretch my goal to $150,000. This would be half of the total for the Winter Sanctuary program. I've got two more days on the streets to make it out here for a full two weeks and it has stretched me. Even though I'm tired, I believe in this cause and I think we can make it to $150,000 in the next couple of days. I'll be riding the light rail home to Capital on Saturday. Please continue to donate and share our social media posts with friends and family so we can reach $150,000 by Saturday! My day has been filled with talking to various media outlets. I woke up early this morning to a text from Chris Nguyen asking if he could cover #revonthestreets for his last News 10 story in Sacramento. I showed up at the Capital and he did an amazing job getting the word out. I read the follow up Sacramento Bee article online from Hudson Sangree. I was interviewed by the Huffington Post over the phone and also connected with the 700 club to do a follow up story. I'll keep you posted when I hear more details on those venues. God seriously is moving in some big ways. I think when it's His thing, helping those in need, He does what only He can do. I was able to spend some more time today too with Sister Libby at Loaves & Fishes. It's incredible to see her heart for those that she gets to help each day. She is dedicated to making a difference in our city as well. I'm amazed at the continuous emails coming through for every dollar donated. I read all of your encouraging notes and affirmation for this cause. I'm humbled by your kind words. The days keep getting sweeter with the amount toward the goal closing the gap. Say a prayer for me tonight around 6pm as I'll be sharing my story at the Sacramento Kings Chapel. Keep sharing. Keep donating. I've had a pretty epic weekend. I was asked to speak at the Loaves & Fishes Safe Haven service yesterday. I was honored to share my experiences with those in attendance. I definitely missed being at home with my church family, but it was a pretty surreal moment on this journey. From there, I went to Project Church where my nephew Caleb Cole leads, and they highlighted what we are doing through the Winter Sanctuary campaign in their services. 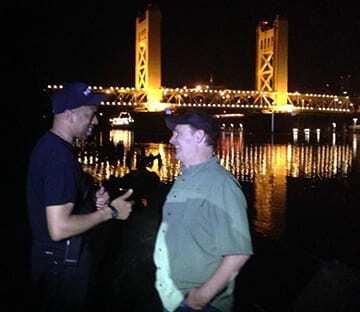 Last night, the Mayor of Sacramento, Kevin Johnson, joined me on the river banks. He refused to sleep in a tent of any kind. He pulled out his sleeping bag right on the sand and I pulled mine up right next to him. I'm honored that he would join me in fighting to save the Sanctuary program. He helped raise awareness and supported me just like a friend. He came around 9pm last night and we got to sit and talk about the city. Dream for our city. There are big things in store for Sacramento. We are coming together to care for the hurting and broken. We are uniting to bring healing and hope. I know this was all part of God's bigger plan! When we all play our part in the bigger picture, we can achieve our goals together. When I woke up this morning and updated the totals on my phone, we had done it! Together, we reached my personal goal of $100,000. Let's not stop. I'm staying out on the street until Saturday. I don't want to lose the momentum we have gained. I was able to do 3 more interviews this morning with Fox 40, KFBK and another Sac Bee follow up. The more people we can reach with this cause, the more feasible it is to make our $300,000 goal! I'm determined that we can do this together. I'm taking a bus tomorrow night down to the Kings stadium to do the players chapel. I'm going to update them on my life on the streets of Sacramento and give them some encouraging truth before their game. It'll be my first time on a bus in Sacramento. It'll be my first time showing up with a beard too. I'm excited for the week ahead and know that God is going to continue to use me right where I'm at. I'm encouraged by your prayers and your donations. Thanks for standing behind me in this cause! Keep sharing. Keep donating. I'm on day 7 of living on the streets of Sacramento. It's hard to believe that we just announced this idea at Church last Saturday night. So much has happened since the idea was birthed and so much money has been raised for the amazing Winter Sanctuary cause. Sometimes it feels like I've been out here forever, and other times it all feels just like a daze. I'm wishing that I could be with you at church this weekend. I'm going to miss my Capital family tonight at 6pm and tomorrow morning at 9 & 11 - but I know I've left it in good hands. Make sure to attend this weekend for a special update from me! It's been an incredible day today. I met a family who's been recently attending our church and they were stirred in their hearts for a while to do something for the homeless. They packed and provided several bagged lunches that they funded themselves and brought down to City Park. I luckily was a recipient of one of these lunches. It hit the spot! I was actually pretty hungry. It was amazing to see several people take advantage of this generous, practical display of love for people. People were lining up! I'm so grateful for everyone's support. You have truly embraced the spirit of who Jesus is. I couldn't be more proud than to walk this journey out with you. Meyer and she was moved by our desire to see Sacramento's homeless sheltered in this winter season. She personally is donating $5000 toward the cause. On another front, I see posts from friends that are teaching their kids the value of caring for others. 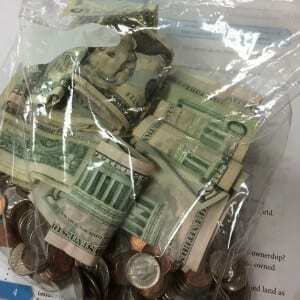 One friend pulled out all their money from their piggy bank and is donating it toward Winter Sanctuary (see photo). We are moving forward in reaching our goal of $300,000. Today has been remarkable. Leaders in our community accepted my challenge and made a huge dent in our goal. I had been told that Ray Johnson from Bayside wanted to meet me at 10am in the City Park, but I wasn't sure what he was going to do or say. When he handed me a check for $13,000 I was extremely happy. I love how we are so much stronger together as a team of faith leaders than we are apart. Our culture is shifting in Sacramento. Everyone is coming together to make our city greater and most importantly to make our God famous. I just received a video from my friend Scott Hagen all the way from Poland today. He & his wife committed personally to $1,000 and though they are out of the country, their Real Life Church was going to step up as well. Crazy how this news is traveling around the world. I love seeing the social reach on the map. People from Europe, Australia, and South America are giving to our need right here in Sacramento. There has been a lot of momentum today which is so encouraging. I was glad that the Sacramento Bee wrote a positive article on my journey as well. You never know how a reporter can spin your personal experience, but I found Cynthia to be very affirming. Thank you for helping push me toward our goal. As I'm writing this we are at $77,627 of my personal goal. That's over 75% of the way there. You are incredible! Your passion to help hurting people fuels my passion all the more. I need your help to keep pushing us over the limit. The goal for the Winter Sanctuary cause is $300,000. I want to help see this goal fulfilled. Thank you to all who have donated. I couldn't do this without you. Your trust in me to see this through helps each night go faster. Continue to share. Continue to donate. Continue watching Capital's Facebook for updates. warm showers, shaving, clean clothes, 3 meals a day and snacks in between, the security of home, the use of electricity when it gets dark outside, and the most recognizable - a good night's sleep! My night with Jacoby was a fun adventure! He's a blast to be with. Check out our video we published on Capital's Facebook for the story about the miracle mattress! Seriously made a huge difference last night. And today we have passed the $50k mark! That means I'm halfway toward meeting my goal. We still have a ways to go to cover the $300k goal of the Winter Sanctuary program. But every dollar donated is making a big impact. I've said it before in years past regarding this program, and I still feel the same today: failure isn't an option! As I was sitting on the Library steps before the doors opened, I found myself having a conversation with a homeless man. I was just curious about why the homeless population was drawn to that building. There are a lot of reasons he shared with me, including the computer lab and restrooms, but our conversation went beyond that. I told him that I'd only been on the street for a few days, stayed at the Union Gospel Mission and then various places on the street after that. He went on to give me some tips about the street. The best part being - he described how the cold winter season was just around the corner and you could make your way to Loaves & Fishes and get into a program that buses people to churches around the city. They give some entertainment, good food, and a warm safe place to stay. He was literally describing the Winter Sanctuary. I never told him that I was out on the street raising money for the very program that was a lifesaver for him. I knew then that the program truly made a difference. It made an impact. It helped. If I can help ease the plight of one homeless person ($11), and help bring some hope and dignity to their soul, than it's all been worth it! It is worth it. Other fun news out on the streets today, I got my TB card approved! Funny the things that get you excited. Also, for those of you who like the insider's scoop, the Mayor called me today and confirmed that he will stay with me for a night next week. I'm honored to call him a friend and I know his heart to make our city stronger and bring awareness to this program is genuine. You wouldn't sleep out here otherwise. Seriously. You make my days easier with every email update I get from every donation. I haven't erased any of them. Your messages, encouragement and every social media share keep me going. I know God is working in me. I know He's going to keep doing miracles. Keep sharing, donating and spreading the word of #revonthestreets to your circles of influence. I've been out on the streets of Sacramento for over 72 hours. I am forever marked and inspired by this experience so far. My biggest challenge is sleeping at night. There is an element of sketchiness, smells, dirt and sounds that wake you up intermittently. I'm also 57 years old. So sleeping on the ground is more challenging. Also, I've been thinking about how it's still mildly warm right now in Sacramento, but it gets cold in the middle of the night. I can't imagine sleeping out here in rain and freezing temperatures. It puts into perspective the value of what we provide through the Winter Sanctuary. If we can raise the full amount of $300,000, we are ensuring over 500 individuals a safe and peaceful place to sleep at night over the 5 month period. There are individuals who want help! I met one man who lost his job, became divorced and ended up on the streets in a moments notice. It wasn't anything he planned or dreamed for his life. He was looking for hope. I'm blessed that you are catching the vision for this project. That you see the value of providing hope for these people. That you are willing to sacrifice with me by donating to this cause. A reporter from the Sacramento Bee has been shadowing me today with a photographer. That's been interesting. It will be fun to read what they experienced in my day. The more awareness we can bring to our community about the Winter Sanctuary program, the better we can serve those who are looking for help. Continue to share. Continue to donate! I also randomly ran into the Mayor today in City Park. That was a highlight for me. I find myself hanging out in the park throughout the day with other friends I'm meeting. I went to the Library today, hung out at the Farmers Market and one of the Mayor's staff members bought me some popcorn and fruit. It's been a good day. Things I've never yet experienced in Sacramento. The days don't seem to be too bad. I have to say, I'm not really looking forward to the nights sleep, but I'm excited that my friend Jacoby Shaddix is coming to hang out with me tonight before he leaves on tour tomorrow. He just started a donation page and has raised over $1500 in less than 3 hours. What can you do to get the word out? 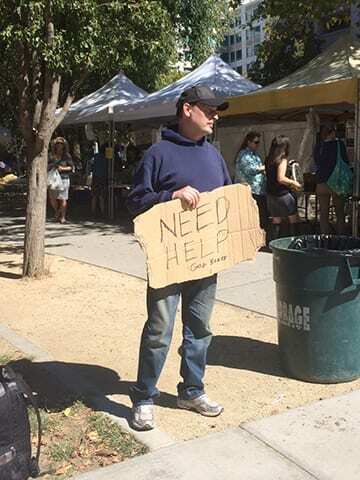 I have hit 48 hours on the streets of Sacramento. Today started off with a tour of Loaves & Fishes downtown. They also fed me lunch and required me to get a TB test. Your perspective of the homeless plight changes when you experience it for yourself. I'm viewing the "homeless" not just as a social problem to fix but actual people with stories. It's fascinating to learn about various challenges in this population. I am still determined we can make a difference. I'm finding the time spent walking the streets can be a little lonesome. My compassion is increasing. The Winter Sanctuary program needs to continue so those who desire a warm shelter, food and companionship are able to get their needs met. Sometimes we all just need a little helping hand. I desire to be that. I know you do too! Continue to follow our updates on facebook.com/capitalchristiancenter. I'm posting daily videos of my experiences on the street. I am forever grateful for your donation and compassion you have to make a difference. Together, we are! Don't forget to share this cause with your friends and family. Every dollar counts. Every $11 is shelter for a person during November 24, 2014 - March 31, 2015. 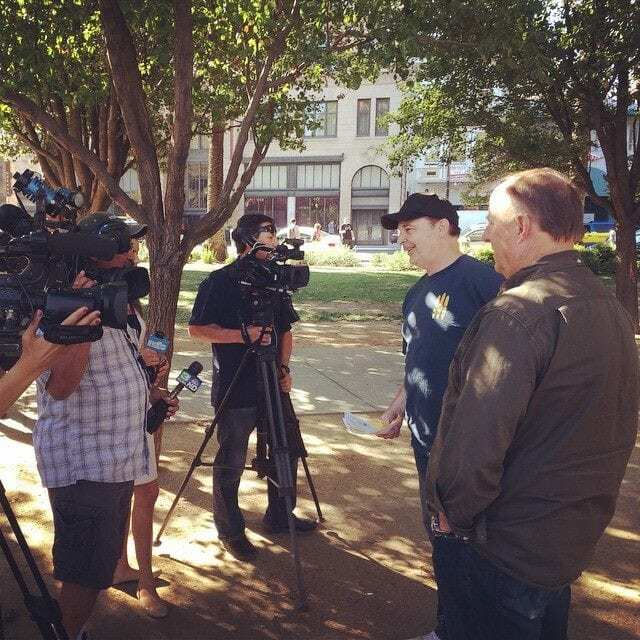 I've been interviewed by Fox 40 to be on their channel tonight at 6pm. Check it out for the most current update of my journey out on the streets of Sacramento. I already have a ton of stories to share and I've been encouraged to write them all down. Tonight I will forego the shelter and stay out on the street. Didn't get much sleep last night so I'm hoping to catch up tonight. It's been an interesting day and a change of pace from my normal life. I'm so encouraged by all of the support and love on this journey so far. Excited to see the donations come in! We are making a difference. The Winter Sanctuary is a blessing for those looking for shelter in the cold months. I can't thank you enough for sharing this story in your social circles. More to come!